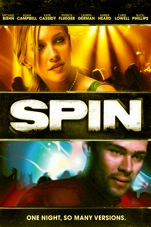 A Hangover-like film: Spin (You are here) is about six twenty-something people trying to recall what they did after having a crazy night at a club in LA. The film starts with this guy, Ryan (Patrick Flueger, you may recognize him from Princess Diaries), who is madly in love with Cassie (Lauren German). After a crazy night, he wakes up in bed with Apple (Kate Cassidy), Cassie’s friend and doesn’t know how he got there. He narrates the events of the previous night to Mick (Adam Campbell). Mick in turn bumps into Audrey (Bijou Phillips) who tells her version of the night before. I think now you get the plot. I enjoyed the way each person recalls the events of their crazy night. I thought the movie was going to lose my interest but writer/director Henry Pincus did a good job of keeping the run-time about 80 minutes. What makes this movie different from Hangover is that it’s not just about the dudes partying and wanting to have the time of their life. And of course, it’s set in LA, so that mellows the craziness. With a twists in the turn of events and Mick’s cool British character, this movie was quite humorous to watch! Do what you want. Do what you feel. Trust the universe and when you do, trust me it will all work out. Sounds deep and meaningful, right? Today, I caught this cute Hallmark TV film: Daniel’s Daughter. The story is about this high powered editor-in-chief of Perfect magazine, Cate (Laura Leighton). From a small town in Massachusetts, Cate ends up in New York after her mother passes away. She hasn’t met her father after her mother’s funeral. One day, she receives a box from her father with his ashes. He requests Cate to fulfill his last wish of spreading his ashes in his hometown in Massachusetts. Cate who believes in fulfilling her father’s wishes, travels back to her hometown and this gives her a reality check on life. This is a cute film about a career driven woman going back to her roots. With some lovely shots from Toronto and Hamilton, this movie is pleasant for the eyes! A film that I would definitely watch when I just want to relax. This is not a new story line (similar to Sweet Home Alabama), but has a charm of its own. I would definitely recommend this when you just want to sit back and watch an adorable film!